Mobile phones are very important means for contribution to well-being in terms of communication and connectivity even at undemanding applications. Digital divide for mobile phones penetration is studied in two dimensions – static index and S-time-distance from benchmark Sweden. Sweden was chosen as a benchmark as it is ranked first in ITU’s ICT Development Index. The analysis for 6 world regions and 3 development aggregates is based on regional data provided by ITU to complement earlier analysis by countries. The exceptional speed of mobile phones diffusion has enabled also developing countries to advance in ten years from 5% to 45% of the penetration level for Sweden. Although the static view of disparities in 2008 remains high (world average is at 50% and Africa at 27% of Sweden) the time distance view shows a more promising picture: world average is less than 9 years and Africa less than 12 years behind Sweden. Visually combining both dimensions and the level of penetration rates provides a broader view of the situation. The digital divide for mobile penetration rate using specific data for more than 200 countries were presented in Time distance view of 200 countries for mobile phones penetration rate. Firstly, the statistical measure S-time-distance measures the distance (proximity) in time between the points in time when the two series compared reach the same specified level of the indicator X. The graph below shows the S-time-distance for the corresponding 2008 values against the time trend for Sweden. The median value of S-time-distance is 7.5 years, which means that about 100 of the countries are closer and one 100 more distant in time from Sweden. Due to space limitations only one name out of each four countries can be printed in the graph, the values for each country are available in the Excel file below. Secondly, time matrix is presented showing the time when a given level of the penetration rate was achieved in a country. In this case a series of levels were chosen so that the next level is approximatelly 50% higher than the previous one. From such time matrix it is possible to calculate the second time distance measure: S-time-step (i.e. time needed to pass from one to the next specified penetration level). It measures dynamics between specified levels that is expressed in time units. The speed of mobile penetration is remarkable, on the average at low levels until 15 per 100 inhabitants steps of 50% growth were achieved in less than 1 year. At penetration levels higher than 50 per 100 inhabitants the average S-time-step becomes closer to 2 years and continues to rise. The four top countries have passed even 11 steps of 50% growth per step. Digital divide may be looked upon from different perspectives and measured by several statistical measures: static absolute and relative differences (e.g. indices) as well as by time distances developed by Professor Pavle Sicherl. Empirically, degree of digital divide may be very different in static terms and in time distances. ITU’s latest statistics, published at the occasion of the ITU TELECOM WORLD 2009, reveal rapid ICT growth but also highlight digital divide. Analysing the dynamic picture of disparities between Sweden as a benchmark and the aggregates for developing countries it was shown that the time lag behind Sweden was only 10 years for mobile phones penetration rate as against 72 years for that for infant mortality rate. Thus the potential of technological progress can with additional help from the world community create an opportunity for the ICT sector to become an important instrument to faster reduce world disparities at least in one domain. Further results for about 200 countries will be later available on www.gaptimer.eu . Time-Distance Study 2009 was published by EUROCHAMBRES as their Position Paper: What Foundations does Europe Need to ensure its Global Competitiveness? The time distance analysis looks at time gaps for four indicators among EU27 and USA as well as BRIC countries. The dynamics in the new century led to two different conclusions about the convergence: the lag behind the USA stayed substantial while ‘what if’ scenarios show that China and India could continue to decrease their time lag behind EU27 dramatically. 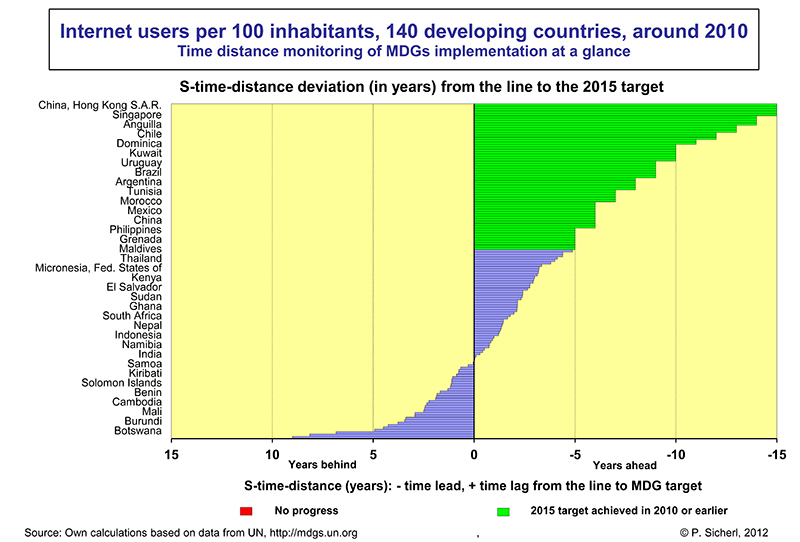 The study also discusses the monitoring of the implementation of the Lisbon targets, the recommendations for further measures and time distance methodology. The time distance approach can contribute a broader way of thinking and changed semantics into the present state-of-the-art of comparative analysis. At the 10th Bled Forum on Europe there was a parallel workshop ‘Foresight Training Workshop for Participants from South East Europe’. Presentation by Pavle Sicherl discussed the potential benefits of time distance method that include also benchmarking evaluation of the starting situation, a presentation and communication tool to describe, compare and visualise findings of scenarios in a new dimension and continuous monitoring for targeted actions. The presentation Sicherl Foresight Training seminar Bled.ppt is available online. More details about elements to be used in foresight are available in an older background paper for the US-EU Seminar: New Technology Foresight, Forecasting & Assessment Methods, Seville, 13-14 May, 2004. Pavle Sicherl presented the poster on the time distance method in foresight analysis with background paper.